create a unified log in experience in both browser and tablet versions of Wixie. This post discusses upcoming changes to the login screen for web browsers such as Chrome or Internet Explorer! Read this post to learn about upcoming log in changes for iPad and Android. If your site uses a third-party authentication system, such as LDAP, SAML, Google, or Clever, you will not see a difference when going to your organization’s custom Wixie domain. When you use the new Wixie log in, the colors will have changed. 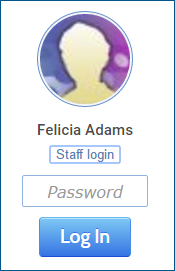 However, you can use the username and password field to log in the same way you have been logging in now. District or school administrators should continue to use this method to log in to Wixie. If you want to try the new features when this update releases, look for a blue link to the left of the “Log in with your username and password” label. If you are at www.wixie.com, the link will say “Find your school or teacher”. If you are at the custom domain for your district, it will say “Select your school”. If you are at the custom domain for your school, it will say “Select your teacher”. You only need to do the following these steps one time! A cookie will be set on your current device and future visits to www.wixie.com will take you directly to your site or teacher. From the Wixie home page, click the Sign In button. Then click the “Find your school or teacher” link on the log in screen. You will see a field that lets you search for your school or teacher. Start typing the name of your school or teacher. You will see a list of matching districts, schools, or teachers sorted by their geographic distance to you. Choose your district, school, or teacher. If you log on to Wixie with your custom domain, such as awesomeschool.wixie.com, you will skip the search step and jump directly to a list of schools in your district or teachers in your school. From the search results list, click a school district to see the schools in that district. Click a school to see a list of teachers in that school. 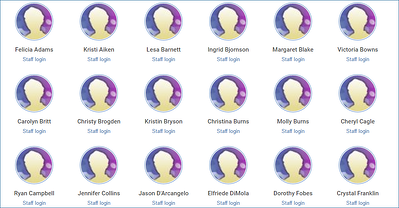 If you are a teacher, click the Staff Login link to display a field to enter and submit your password. If you are a student, select your teacher to see a list of that teacher’s classes. Select your specific class. Click your name. Enter your password in the field that appears and click the Log In button. 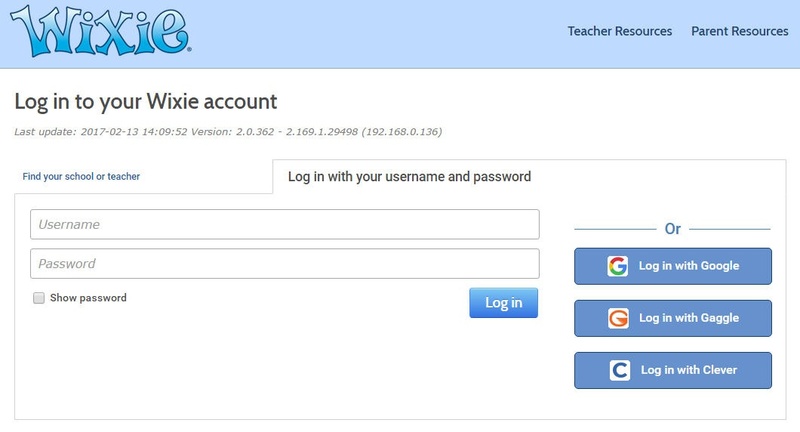 After you have logged in once using this method, a cookie will be set on the device to remember the school. The next time you go to www.wixie.com, you will be taken directly to the list of teachers for the school.